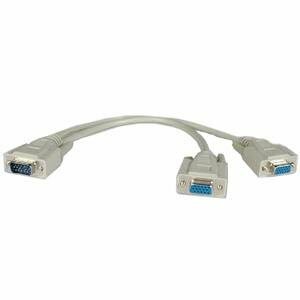 Tripp Lite's 1ft VGA/XVGA Monitor "Y" Splitter cable provides an inexpensive alternative for splitting the video signal from your PC's VGA port to two monitors that use standard 15 pin plugs. Perfect for laptops to display on a separate, larger monitor. Use for short distance applications only. Workes fine, I used it to split my VGA display of my HP Media Center PC to my HDTV that has a VGA input this works great gives me a bigger screen to watch some of the recorded TV from the PC.